It’s definitely fall soup time this week! Leeks – To clean these properly, cut in half lengthwise and run the inner layers under running water to get any bits of soil out. The white part of leeks can be used like onions though they have their very own flavor. Try potato and leek soup. Salad Turnips – “Hakurei” – Remember these from the springtime? Well they are back! Scrumptious raw in salads, or cooked (try roasting alongside potatoes or chicken/pot roast, or add to a veggie soup). Remember those turnip greens are good to cook up as well. Celery – Another good soup and stock ingredient! Collard greens – Nice and big today. 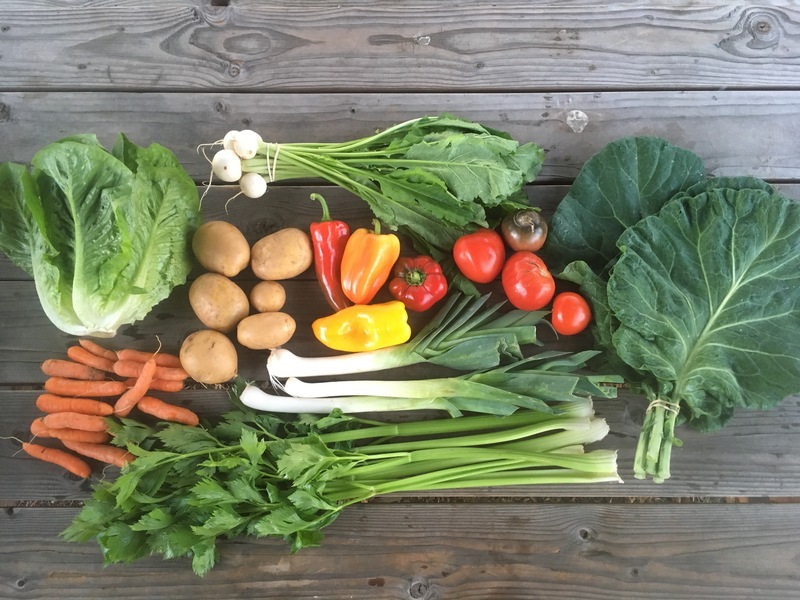 Here’s a recipe for vegetable soup that uses a bunch of the ingredients from this week including collards. Sub leeks for the onions. Carrots – Pretty small this week, but tasty. We spent a ridiculous amount of time locating these amidst a very weedy bed today. Sweet Peppers – Are still ripening in the field though much more slowly. Tomatoes – OK I know I’ve said this before, but I really think this is the last week for tomatoes! Except for maybe green tomatoes… Enjoy those last tomato sandwiches of the year from fresh toms. Lettuce – Romaine returns at long last to the share. These heads were heavy today due to the big rains yesterday.